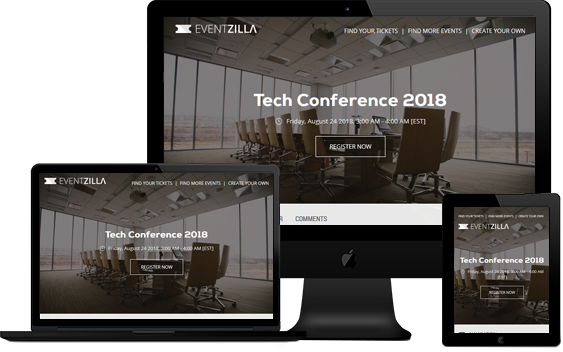 Eventzilla provides the tools to tailor your conference registration experience that fully aligns with your brand and resonates with your attendees, speakers, exhibitors, and sponsors. Easy drag and drop setup, plus no coding skills required. With attendee self-service, automated wait lists, and schedule email notifications options you can automate all the repetitive tasks and focus on creating the best event experience for your attendees. No matter what size your event is, we've got you covered! You can create a professional looking conference event registration page in less than 5 minutes. We offer the best pricing in the industry. You can choose to absorb the fees or pass it on to your attendees. You can create custom reports to track ticket sales and payments in real time. Promote events easily with email invites, discount codes & more with our built-in features. Flexible schedule builder with support for multiple parallel tracks and sessions. Publish rich speaker profiles and make them your event ambassadors. All-in-one conference registration platform with daily payment withdrawals to your bank account. "5 stars all the way..."What a great service and easy to use. Further, you get your cash NOW, no need to wait at the end of the event. Customer support is awesome. "Great software, easy to use! "I really liked all the features available for event management. We held an event for 150 and could not have handled registration without it.